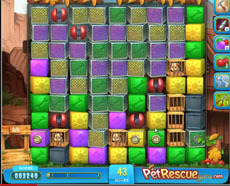 In pet rescue level 119 drive the captured pets in the penultimate line. This is your first task. Destroying all the other wooden cages under them. Then you have to drive a line blaster in this line in order to release them. After that clear the blocks under them in order to be rescued. While playing you can use the line blasters to smash the wires of the blocks that fall above the screen or get rid of any annoying line. Watch our walkthrough video to see our strategy.